The ten vortices of the third chakra may have been indicated in the Spider Web formation that appeared next to Avebury in 1994. This can be a way that a clairvoyant sees the third chakra from the front, with the sub-elements forming the shape. In the middle is the Hara-Line centering the whole crop circle. The Bythorn formation of 1993, also had ten elements, with an old "magic" symbol, the pentagram, in the middle. Another formation at Uffcott in 1994 had two pentagrams, which formed the ten elements of the third chakra. At this point, I will give some additional information of my own concerning the third chakra symbols, before continuing to review Jens's article. The petals of the lotus flower in the Bythorn Mandala can be constructed by twenty interlocked circles. This could also indicate the "double-chakra," suggested in Jen's article. When I originally read Jen's article, I already associated the Spider Web and Bythorn Mandala formations with the third chakra. After the 1993 crop circle season, an article appeared in the SC (Sussex Circular) newsletter, reporting the dowsing pattern found in and around the Bythorn Mandala formation. The dowsing pattern was like a huge spider's web that projected far out beyond the formation. Around that time a correspondent reported a dream in which a spider web pattern was on the floor of the room where he was standing. He was standing in the center of the web, which projected out beyond the room, apparently to infinity. Perhaps the most significant spider dream experience was reported to me by a sixteen-year old girl, my son's girlfriend, Melissa, in early 1991. At the time, her older sister, Christy, had been missing for three months. She dreamed that Christy came to her, holding a huge spider (about 6 inches long) cupped in her hands. Christy said, "This is our spider. Only you and I can touch it. If anybody else does, they will die." The same afternoon, Christy's best friend called Melissa, and said she had a dream. Christy came to her holding a spider in her hands. She said, "This is our spider. Only you and I can touch it." Yes! The two girls had the same dream on the same night! I informed Melissa of another dream reported to me by Jeff, the young man who lived next door. In his dream, he looked out of the window of his house and saw his worst enemy kissing his ex-girlfriend, Terra. He ran outside and started beating his enemy, striking him in the face with his fists. Suddenly, the young enemy's face transformed into the face of his best friend! He stopped striking the boy and asked Terra what was going on. She walked into the house, and Jeff followed, asking again, "What is going on?" Suddenly, he felt something on his hand. He looked down and saw that it was a Black Widow spider. He flicked it off of his hand, and it instantly landed on the hand of another boy who was standing in the room. He continued following Terra, when suddenly, he felt a sharp pain on his hand, which woke him up. A large red welt was raising on his hand, as he had apparently received a real sting or spider bite! I suggested to Melissa that a spider leaves a thread from one point to another, perhaps indicating spiritual connections between us. It seems similar to Jung's idea of a collective unconscious. Jeff's dream seemed to show a negative effect, whereas Melissa's and the friend's dreams indicated a loving, positive connection. The name, "Black Widow," comes from the fact that the larger female kills the smaller male after mating, and plants the eggs in the father's corpse, from which the offspring feed. I showed Melissa the Hopi creation story in a myth book. Spider Grandmother helps the humans evolve from lower animals, over time in several stages. After three stages in chambers underground, the people climb to the surface. Then, Spider Grandmother teaches them how "to weave." The depiction with the story has a twelve-petal sun flower, perhaps suggesting the pattern humanity will learn "to weave" at the forth stage, the Heart chakra. The depiction, I felt, resembles certain crop circle formations, as it had pathways between chambers, and rectangular boxes on the sides. "The concept and vast body of teachings embraced by the word tantra is far more ancient than any scholar or historian could ever trace. The word itself comes from the ancient Sanskrit root word meaning to weave. Tantra is the stuff of life, the unique fabric of our lives which we have woven over the tears." "Basically my attitude is to get people from all walks of life interested. There needs to be cooperation. Scientific and metaphysical symbols which have been used by psychics and mystics for centuries are appearing, yet some key shapes are runic, and some will see Sanskrit and Hopi Indian correlations." I felt that Isabella was again accurate in the prediction, because I had found that the correlation between the Sanskrit word "tantra," meaning "to weave," and the Hopi myth of Spider Grandmother teaching how "to weave." I sent all this information to several crop circle researchers, first to Pat Delgado, in 1991, and to Leonie Starr and John Michell in 1992. When I later read about the spider web dowsing pattern in the 1993 Bythorn Mandala, I felt it was a confirmation that dreams and myths are related to the crop formations. I felt even more confirmation when the Spider Web formation appeared in 1994. In the months following the appearance of the Spider Web formation, a friend put me in contact with Carl Munck, because we both did research involving ancient numbers. In a letter to Carl, I asked if the number ten had a special significance, other than its association with our base-ten number system and the fact that humans have ten fingers and ten toes. Carl wrote back, informing me that ten hertz (cycles per second) is the base harmonic of the planet Earth, found at its very core. He also sent two of his "Code" newsletters. One of the newsletters explained a very ancient form of "Gematria," special numbers that had "word" meanings. Most of the numbers I had found significant in my studies are also in the Gematrian system. I had a dream after that, in which I saw a circle divided into segments, and I knew it was about the Gematrian numbers. Carl had pointed out that the Gematrian numbers have just two tangents if the plus and minus signs are ignored. I drew a "Gematrian Wheel," based on my dream and the relationship of the tangents. The "Gematrian Wheel" has ten segments, just like the Bythorn Mandala and Spider Web crop circle formations. The "Wheel" has 360-degrees, and each segment has 36-degrees. The numbers progress in this order - 36, 72, 108, 144, etc. Full revolutions progress in the same way, but with a factor of ten - 360, 720, 1080, 1440, etc. The progression continues, so that, for example, the Biblical number 144,000, is 400 times around the 360-degree Wheel. I sent a letter to Carl, informing him of my dream and the resulting "Gematrian Wheel." He published the letter in "The Code" newsletter, and elaborated at length. I had proposed to Carl and others that the ancient numbers were appearing in various ways in the crop circle formations. Carl had already found possible connections to the crop circles in his own work. Support for the idea later came from German crop circle researchers. The links in this paragraph go to a section of our site about the ancient numbers, titled, "Code of the Ancients, The Code of Carl Munck and Ancient Gematrian Numbers." The Bythorn Mandala is quite similar to a Yantra of Kali. In the eastern religions, Kali is the goddess of "death or destruction creation," which is equated to a seed growing into a plant. The seed is destroyed in the process of the plant's growth. Kali evokes the emotion of "tamasisk," meaning anger or fury. She wears a girdle of severed human hands, to signify the action of karma. Her skin is often colored dark blue or black, and often the color red is in the various depictions. I came to see that Jeff's dream of the Black Widow may be related to this "Kali" symbolism. The Black Widow also has a red marking. Mating with her results in death, yet from the death comes new life. Jeff felt the "tamasisk" - anger in his dream, and violently attacked the enemy, who transformed into his best friend. His hand was not severed, but he did receive a "real" bite on his hand. The five-pointed star within the Bythorn Mandala formation had two points facing North, and one point facing South. I later read in The Secret Doctrine, on page 5, that a five-pointed star with two points or "horns" up, is an esoteric symbol of the Kali-Yuga time cycle. In the eastern beliefs, we are still in the Kali-Yuga time cycle, also called "The Age of Iron." In the Hindu system there are four Yugas associated with four metals - gold, silver, bronze and iron. This also seems to have a Biblical connection. In Daniel 2:31-45, is the story of Nebuchadnezzar's dream of the frightening image, which had a head of gold, breast and arms of silver, belly and thighs of bronze, legs of iron, and feet of part iron, part clay. Daniel interpreted the body parts/metals of the image to represent the Ages. I came to see a correlation between Kali and the harlot of Revelation 17 (see "tamasisk" link above). The harlot is associated with "ten horns" in Revelation 17:3 and 17:16. The thought came that the ten horns may be related to the proposed third chakra crop formations above, and to the "Gematrian Wheel." A "frequency" or "vibration" may be suggested, in terms of the tangents of the numbers, which are similar to those of a sine wave. I pointed out in my article, Humanity On The Pollen Path, that various parts of the Bible, such as Revelation 11:11, suggest a time cycle involving "three and a half" out of seven, which seems related to universal elementary ideas relating to the chakra system and its midpoint. The idea is that humanity has been on a path that corresponds to the consciousness levels of the chakras. A great change comes at the "3 1/2" midpoint, the fourth chakra, or heart chakra. This may be indicated by the twelve stars of the Woman With Child in Revelation 12, and by the New Jerusalem in Revelation 21, which has twelve angels, gates jewels, and pearls. Now, back to the review of Jen's article. The fourth chakra is the heart chakra, and has 12 vortices. Jen wrote that this could be indicated in the "Scorpion" formation that appeared at Barbury Castle in 1994, with its twelve circles. Other, similar formations had 12 or 13 single circles. The 13th circle may be the Hara-Line. The pattern is spiral-like, as is the energy flowing into the chakras. The above pattern also had two crescents, suggesting the second chakra. The formation may be suggesting an energy exchange between the second and fourth chakras. The second chakra is concerned with one's own body, and the fourth chakra is associated with the feelings toward other people. A formation appeared at Bayard Hill in 1994 that had 12 circles. The circles were not lined up in a slightly bent line, but were in the "normal" design of one main circle with several attached circles. It is an extra- special interpretation of the heart chakra, according to Jan.
At this point, I will mention three formations that were not included in Jens's article. A "Torus" formation appeared in 1997 that may also suggest the fourth chakra, as it had twelve interlocking circles. The formation is of particular interest to me. I drew a very similar pattern in 1992, and sent it to crop circle researcher, John Michell. It was based on my dreams, and the geometric similarities to the sun flower in the Hopi creation myth of Spider Grandmother, as the pattern we will learn "to weave." My theory was that it is basically The New Jerusalem Plan, meaning "the order of the Heavens made apparent on earth." Some months after sending the material to John, I realized the connection to the Heart chakra, the forth stage in the Hopi myth. My drawing had a 12-pointed star inside the circles, formed by four overlapping triangles. It was drawn by connecting lines between petal tips. The same star is within The New Jerusalem Plan. A similar star appeared in 1997 at Clay Hill. Note that three lines project from each point of the 12-pointed star, for a total of 36 lines. This is the base number in the ancient Gematrian system. A ribbon-like pattern also appeared in 1997. The ribbon did not go completely around. The basis of the ribbon design is an inner and outer set of interlocking circles. If the pattern is continued around to form a complete circuit, there are 12 inside, and 12 outside circular areas. This fits quite well with the idea of the "double chakras," and the Sum of Vortices of the fourth chakra. Jens mentioned that a "Jelly-Fish" formation appeared at Cheesefoot Head in 1995. It had 16 semi-circles in the outer ring, which fits with the 16 vortices of the fifth chakra. It also had an "appendix" shape, similar to the "scorpion" formations. A similar formation appeared the same year at Danebury Hill-fort. Jens assigned the fourth chakra to the "scorpion"-shape formations. Jens suggests that the two formations may show an energy flow from the fourth to the fifth chakras. A formation appeared at Gander Down, near Alresford, that had 32 circles, the sum of the front and rear vortices of the fifth chakra. It looks somewhat like a solar system, with an asteroid belt around it. Another formation appeared at Goodworth Clatford that had 16 interlocking circles. This seems to be a "simple" fifth chakra, Jens said, because it has no "appendix." In the very center is the Hara-Line. . The formation that appeared at Langton Herring in 1994 had 32 little circles in and around a ring with a large circle inside corresponding to the Hara-Line. An "Asteroid Belt" - like formation appeared in 1995 at Bishop's Sutton, near New Alresford, Hampshire, that had 96 little circles. This may suggest the 96 vortices of the sixth chakra. A more interesting and awesome formation appeared at Windmill Hill in 1996. It had 194 circles, aligned along three "arms" of a spiral. Figuring one circle for the Hara-Line, this gives just one circle "too many," to match the 192 vortices of the "double" sixth chakra. There are said to be three subtle forces in the sixth chakra that will be united. Jens did not mention it, but the sixth chakra is depicted with a triangle inside a flower. Note that triangles are suggested in the above formation. If lines are drawn between the three circles near the central circle, a pattern is formed that is similar to the famous Barbury Castle formation of 1991. In the Windmill Hill triple spiral, more triangles can be drawn between sets of three same-sized circles, to form more triangles, all centered around the central circle. At this point, Jens wrote, there are no formations with 972 circles, so we do not have one to match the seventh chakra. But, we have a kind of start for the seventh chakra. A formation appeared in Washington State in 1996 that had seven circles in a curved line. The seventh circle was very special, having 12 segments of standing crop inside. It is said that the seventh chakra has 960 "white" vortices, and 12 "golden" vortices, for the sum of 972. The circles inside the rings of the formation may signify the Hara-Line, which runs through all the chakras. So, the formation may represent the chakra system of a human being. The depiction above shows a similar pattern of seven flowers in a curved line, with the size of each in a similar "thought bubble" - like order. It is an old picture made by an Indian saint, after deep meditation. In the upper-left side of the picture, there is a four-petal lotus, representing the first chakra. On the lower right are the seven flowers. To the left of the flowers is a coiled snake, with the upper part of its body standing up. This is the "serpent power," the kundalini. "The old Indian texts say that the kundalini is rolled up three and a half times, before it rises up the spine. It is sleeping in every one of us, before it may be awakened with the help of meditation; as it rises the kundalini becomes a straight line. Like the kundalini, this crop circle consists of a single path which is rolled up three and a half times." I found this especially significant because of my experiences which revolved around Revelation 11:11, where the two trees stand up after three and a half days. The above depiction is an 18th century scroll from a Tantric school in India. 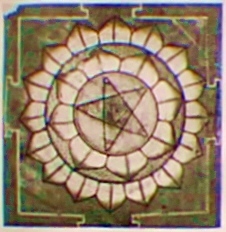 At the bottom the third chakra is indicated by the ten-petal lotus flower. Above is a rolled up kundalini. It is depicted as a snake, the most common symbol for this subtle force. On the upper right is a teardrop-like shape, which is said to be a way of stressing a letter of the Sanskrit language. In 1996, teardrop shapes appeared next to triangle formations at Roundway Hill (left picture) and Etchilhampton (right picture). I have more information about these two formations later in this article. Jens theorizes that the 1990 Cheesefoot Head formation shows what the chakras are doing. There are seven parts to the formation. Chakra numbers 1, 3, 5 and 7 are the more structured ones. They are connected to mind and the matrices and grids which form the aura and the body. Chakras 2, 4 and 6 are connected to the feelings. In the crop formation, these chakras have circles, whereas the others have lines. The exception is the third chakra. According to clairvoyants, the third chakra takes the feelings in and processes them, so that the feelings can be understood by the mind. Another formation that may suggest the seven chakras appeared at Cissbury Ring in 1995. It had seven concentric rings with an offset center. It is said that the chakras exist in seven levels, and that the aura is made of seven "layers." Every chakra goes through every layer of the aura, and every chakra has seven levels. 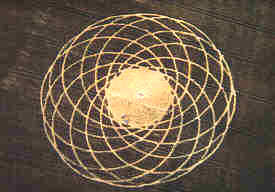 A formation appeared at Woodford in 1991 that had seven concentric rings. The rings are not the same width, and this may be meaningful. This formation had two equal-sized circles touching. One was divided into four parts, and the other had a crescent shape inside. It could show an energy flow between the first and second chakras. This formation from Somerset could be similar to the one above in meaning. It was a wheel-shape with six spokes, with four projections out from the rim. So, again, it may suggest an energy flow from the first to the second chakra. Interesting too, the word chakra means "wheel." This large formation appeared near Winchester in 1995. Jens says that to analyze it, one must know that the fifth chakra is a template for the first chakra. In other terms, it is a blueprint for everything that is generated from the first chakra. The primary "quincunx" of circles in the ring link to the first chakra, and the 16 little circles indicate the fifth. The fifth chakra gives shape to the first. The 1996 formation near Oxford, above, is another example of seven circles. A simple series of seven crop circles appeared in 1996 at Hertfordshire, near Kings Langley. Jens concludes by writing that there has been an evolving form from the first to the sixth chakras over the years. Perhaps a formation will appear that will clearly show the seventh chakra. At least two formations gave an overview of the whole chakra system. A study of old East Indian texts may reveal additional information. The upper two chakras only work within a person with highly developed consciousness and with higher perception. Jens asks, "These chakras formed in the crop fields, are they some kind of energies on our earth? Go on and find out yourself! Try to feel it within your energy field, which may be impressed - via the single chakras - in the crop circles!" This page was last updated April 8, 2001. If you have any questions about this page, contact Joe Mason or Dee Finney.